Vacation Rental Desk&apos;s professional websites come with a guestbook so you can share positive guest reviews and past experiences directly on your site. 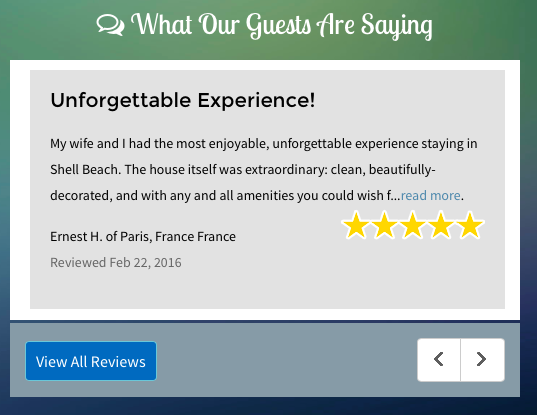 After a stay at your vacation rental, guests have the opportunity to write a review about their experience. Guest reviews help bolster your rental&apos;s legitimacy in the online sphere and add credibility to the amenities and features you share on your website. Many consumers today say they wouldn&apos;t purchase a product without first doing some research and reading the reviews. The same goes for vacation rentals! You can find the Guestbook under the Settings >> Website tab of your Member Dashboard. Also, make sure to mark orders as "Closed" after the guest checks out. Doing so will send the automated "Check-out Email" to guests with a link to post their own reviews. If you&apos;ve never taken reviews before in your vacation rental business, consider going through past orders and sending out review requests to previous guests. To do this, open an order and click "Email Guest," then choose "Guest Review Request."